Food is the body’s fuel. And just like a car, the body needs quality fuel to sustain excellent performance. Unfortunately, malnourishment is common in seniors. One literature review found that 15 percent of seniors who live at home are malnourished. Among hospitalized seniors, the figure rises to an astonishing 23-62 percent. Healthy eating is critical to healthy aging. Here are six important facts you might not know about senior nutrition. Oral health problems such as missing teeth, poorly fitting dentures, or gum disease. Dementia and other cognitive challenges. Seniors may forget meals or forget that they just ate. Swallowing disorders. Many seniors struggle with painful or difficult swallowing. Those with dementia and some respiratory problems face a heightened risk. Cardiovascular disease, diabetes, and other chronic illnesses. Seniors with chronic or progressive illnesses may need to eat special diets. For example, a diabetic needs to eat low glycemic index foods. These restrictions can feel overwhelming, especially to seniors who face financial or logistical barriers to accessing healthy food. Healthy eating is one of the most important weapons in the fight against age-related decline. Omega-3 fatty acids, for example, may prevent or slow dementia. A diet rich in calcium and vitamin D can lower the risk of osteoporosis and bone fractures. A diet low in saturated and trans fats may lower the risk of heart disease, while fiber-rich foods can help with constipation. As a person ages, they have less lean muscle mass, a slower metabolism, and more difficulty absorbing certain nutrients, such as vitamin B12. Some seniors may also need more protein as they age. But a sluggish metabolism can mean more weight gain. So seniors must choose nutrient-dense foods such as eggs and rely less on high-calorie, low-nutrition foods such as white bread. Changes in energy and mobility that make it difficult to cook or shop for healthy meals. Cognitive decline in seniors with dementia that can make remembering or following recipes challenging. Anxiety about mobility issues. Some seniors fear reaching for a beloved spice or spending a lot of time on their feet, citing the risk of falling. Being over the age of 75 is an independent risk factor for poor nutrition. Yet social status, gender, and other social and environmental factors also influence nutrition. Women and racial and ethnic minorities face a greater risk of malnourishment. People in rural or isolated areas also face a greater risk because accessing quality food is more difficult. In 2016, 4.9 million seniors (7.7 percent of the senior population) were food insecure. Seniors who are food insecure may be unable to afford healthy food or may skip meals to pad their budget. According to Centers for Disease Control and Prevention (CDC), more than one third of seniors over 65 are obese. Obesity is a major disease risk factor and can compound the effects of conditions seniors already have. For instance, carrying extra weight can intensify joint pain and cause rapid declines in mobility. Seniors concerned about healthy eating must strike a balance between getting the right nutrients and not overeating. They must also find ways to enjoy food without overindulging. Moderation is key. 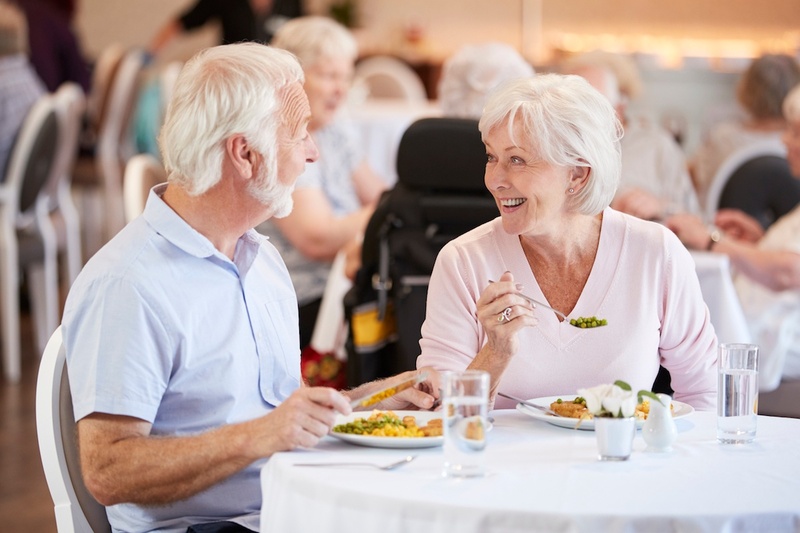 At Arbor, we are committed to helping all seniors find diets that address their needs. We offer a wide variety of healthy, nourishing, delicious food. We can accommodate all dietary goals and preferences because we know that everyone deserve a great meal.